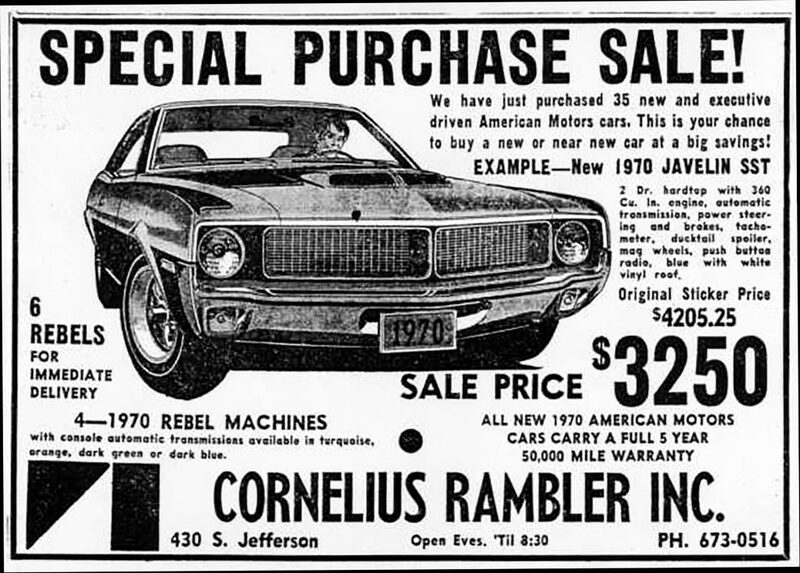 Available between 1968 and 1974, the AMC Javelin would be, based on total production, the rarest of the cars we refer to as pony cars. 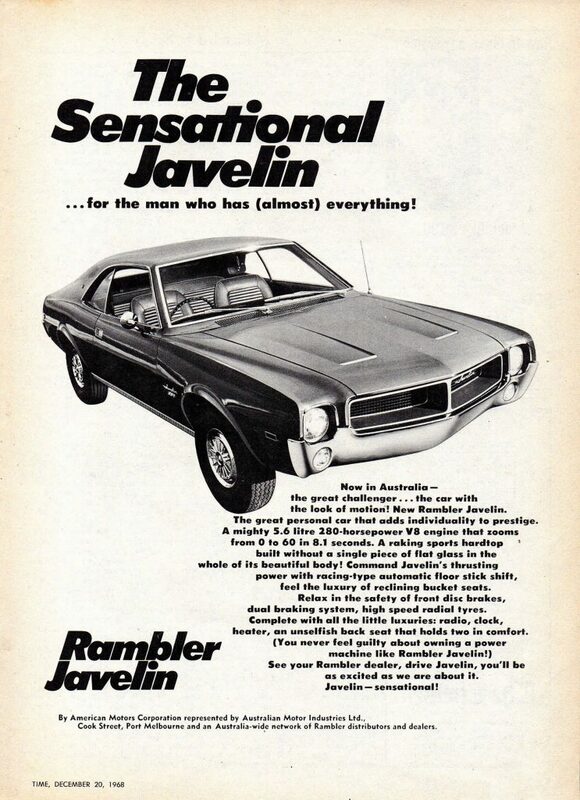 That said, it’s possible the Javelin is among the most beloved—at least among readers of Collectible Automobile magazine. 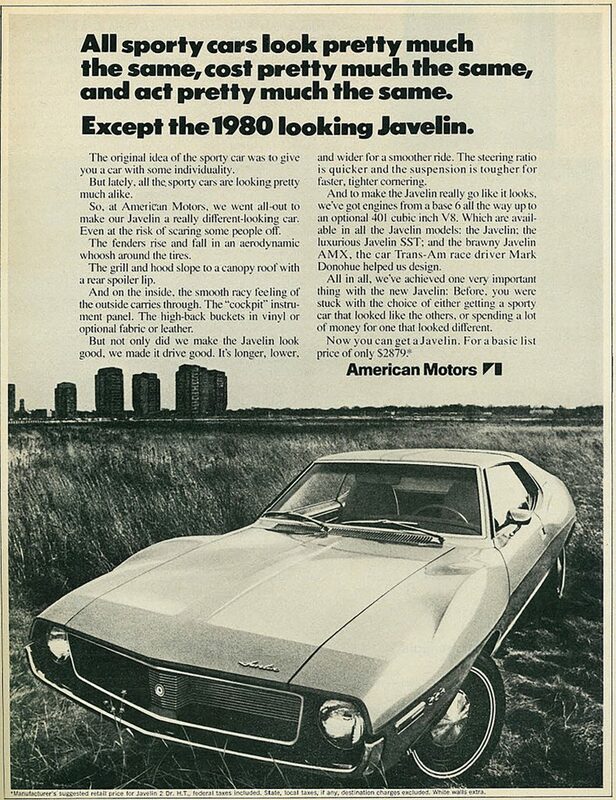 It’s really not just the Javelin, it’s every American Motors product. 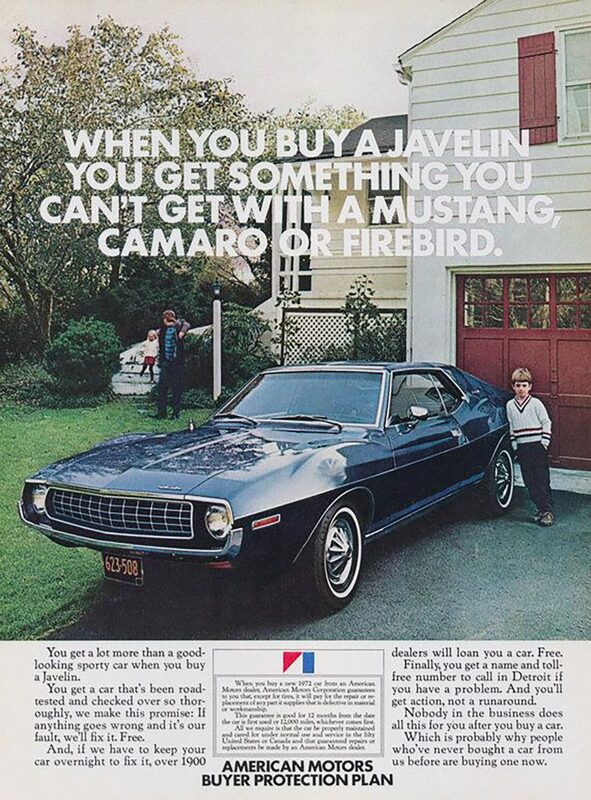 So, to honor the loyalties of our Facebook friends, we celebrate here the only pony car ever assembled in Kenosha, Wisconsin… the Javelin. 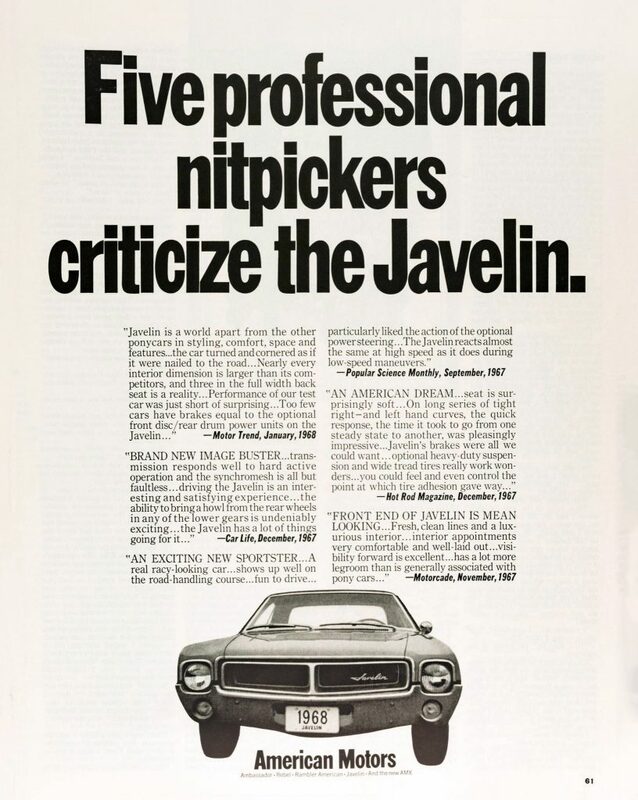 For those not in the know, the Javelin was redesigned for the 1971 model year. 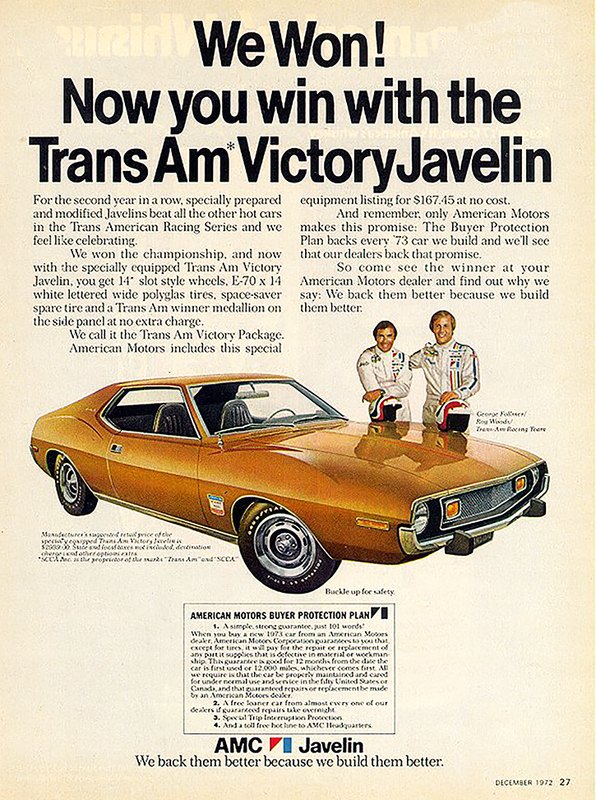 It was at this time that the AMX became part of the Javelin lineup, instead of a separate model. 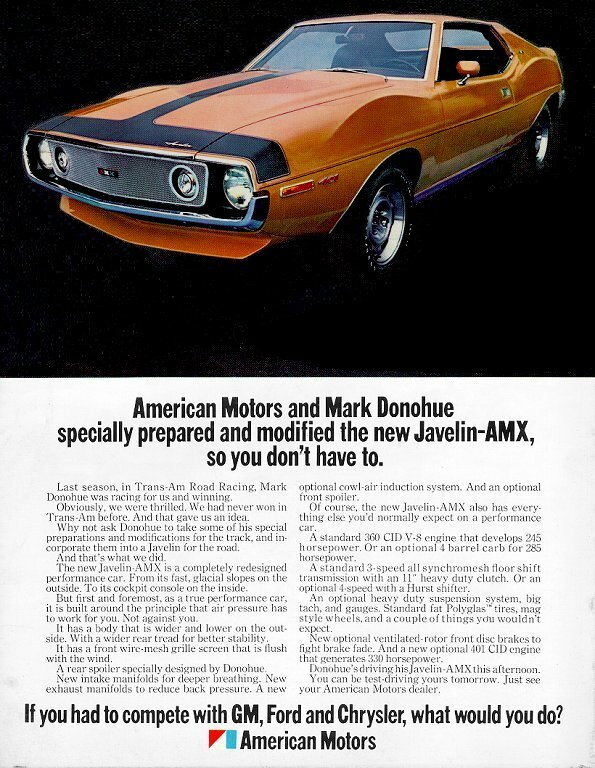 Though the Javelin and AMX were mechanically similar, the 1968-1970 AMX rode on a wheelbase fully 12 inches shorter than that of the Javelin, and came only as a two-seater. 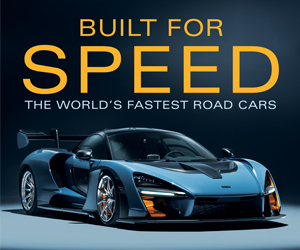 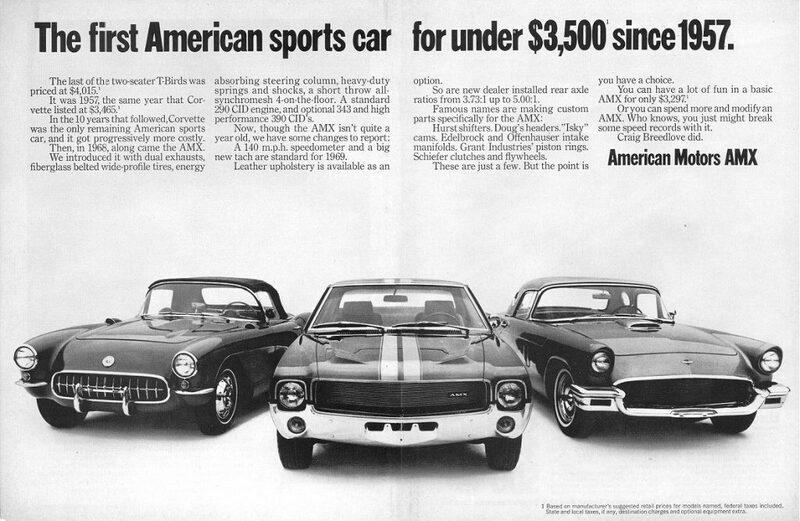 For that reason, we’ve always considered pre-1971 AMXs sports cars, not pony cars. 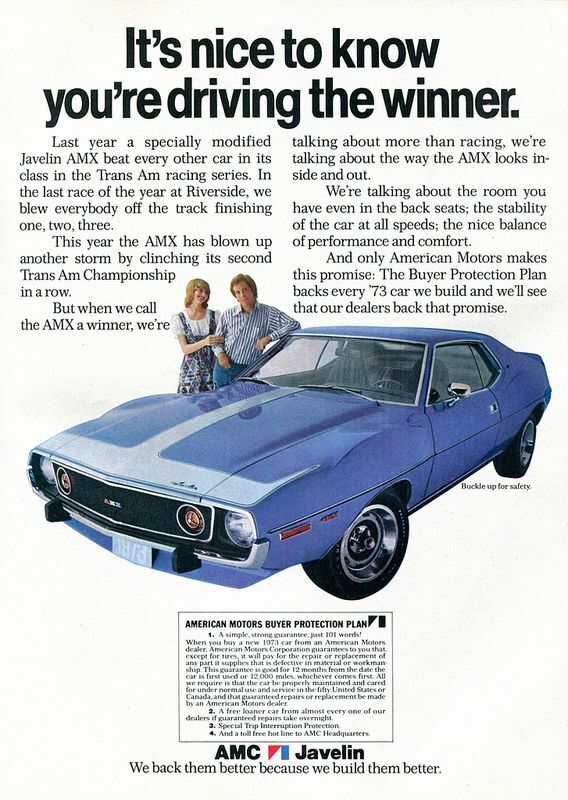 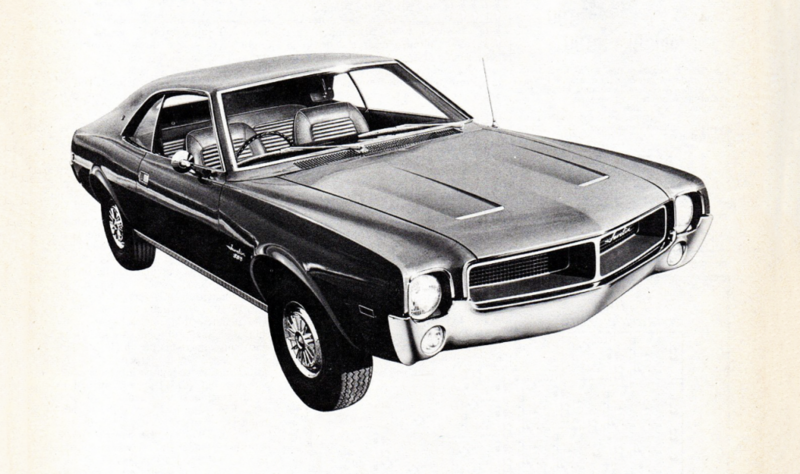 For 1971, the AMX became Javelin’s top-performance trim level, no longer riding on an exclusive chassis. 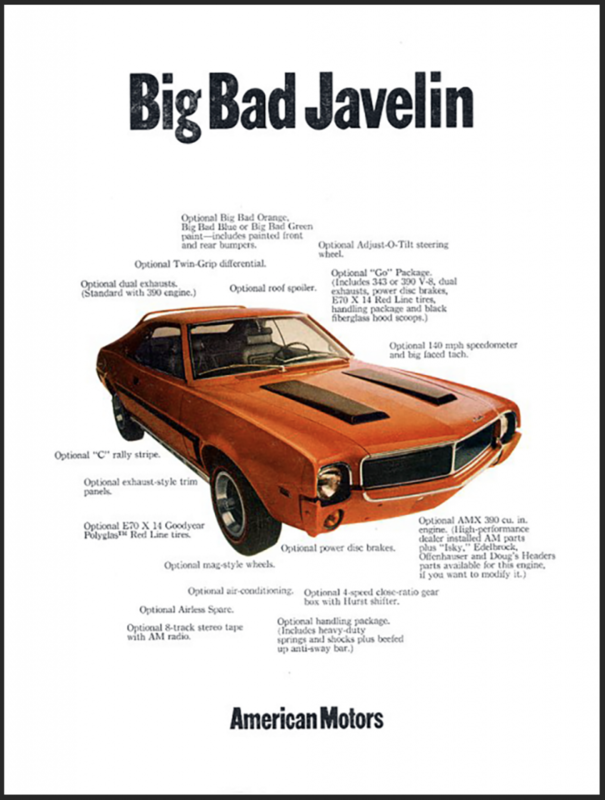 The Javelin disappeared after 1974, which was fine with most enthusiasts, as low-lead gasoline and new emissions regulations had strangled horsepower figures to depressingly low levels. 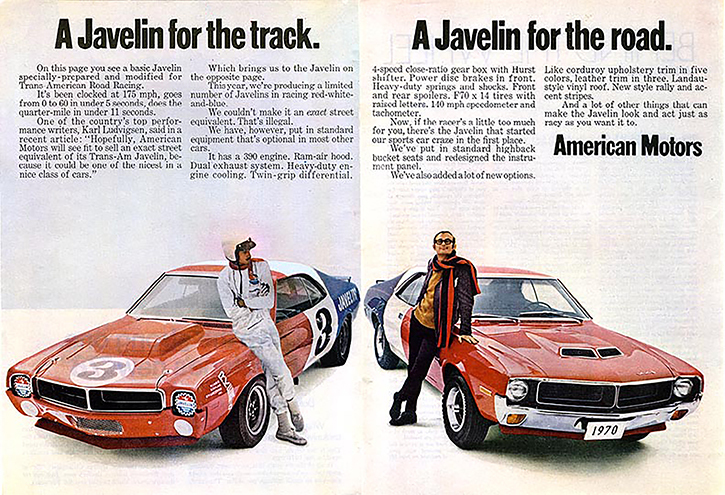 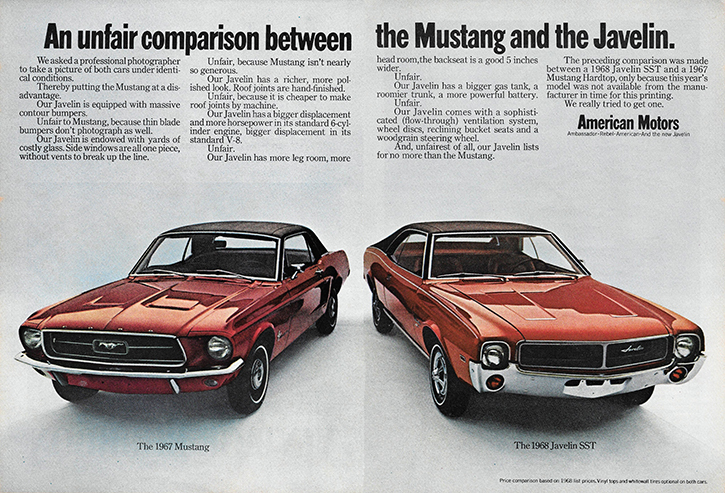 Shared here is a collection of Javelin and AMX print ads; please share them with all the AMC fans in your life. 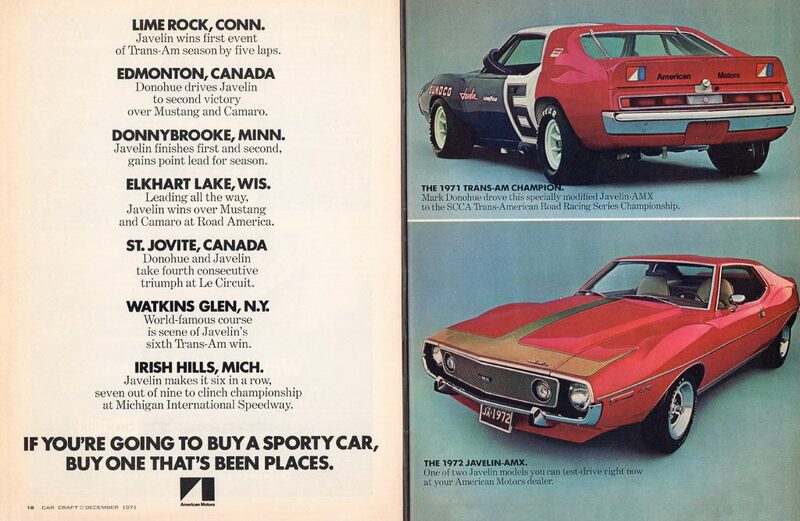 If you happened to have ever spent time with one of these AMC pony cars, please tell us about it. 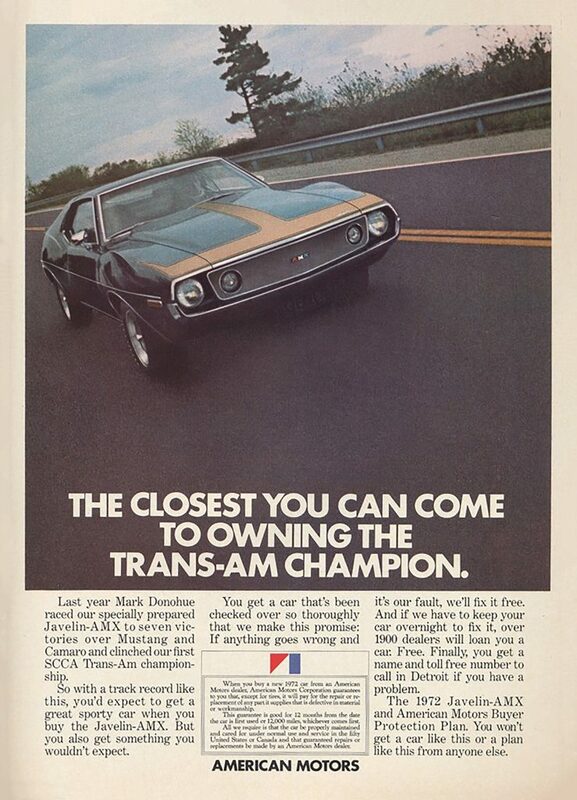 The place to leave comments is down below. 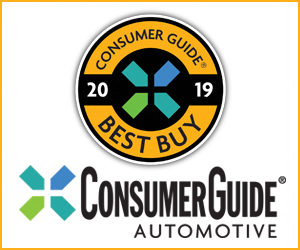 Written by: Tom Appel on April 11, 2019.